There has been so much talk over the past couple of decades about the ‘Law of Attraction’ and how we can ‘manifest’ into our lives pretty much anything that we believe we can have - as long as we are behaving in a way that is congruent to our beliefs. If you were in town and started to feel hungry you might step into a store and glance at the snacks available on the shelves. You may be looking for something specific; especially if you know the store well and the kind of stock they usually hold. But whether you are looking for something specific or simply browsing the available stock, you are inevitably (and without thinking about it) screening out a large number of potential options that lie before you. There may be a few options that you consciously weigh-up in that moment but there will be many that you are completely deleting with no conscious consideration whatsoever. For whatever reason, whether it is a matter of taste, size (both yours and the packet’s ! :) ), food allergies, or on nutritional grounds, these are the items that you are repelling with barely a thought. This is the law of repulsion at work. If you were to attend a networking event, the same law might be seen at work. There will be individuals or small groups of people that you find yourself attracted towards and there will be others that, for reasons you are probably not consciously aware of, you simply don't find appealing. You may be a great judge of people but you can never know the value that lies hidden in a situation until to engage with it - and do so with an open mind.... and heart. The trick, of course, is to become aware of the unconscious preferences that are guiding your behaviours in such moments because to make a poor choice in either of these situations could have a significant impact upon your future. Have you any idea what the Law of Repulsion might have actually cost you in the past? Of course, we do not have the time or money or energy to choose every option laid before us, but it is well worth seeking clarity on those negative, momentary ‘vibes’ that cause you to pass certain options and opportunities by without a second thought. Become aware, then, of your moments of decision throughout the day - especially when it comes to starting or in deepening relationships with people who might prove key to your success. Are there people whom you would love to reach out to you in your dreams - but would be scared to reach out to in reality, as you feel they are simply outside of your league? Are there job roles you have pushed away because you feel inadequate to the task and demands that such a role might place upon you? In these, and 1001 similar situations, there is of course a vital part to be played by good sense (and many people have, at times, bitten off more than they can chew) however we are all guilty to some degree of failing to maximise the opportunities that could so easily be ours for the taking, because we are unconsciously repelling great choices that appear before us. 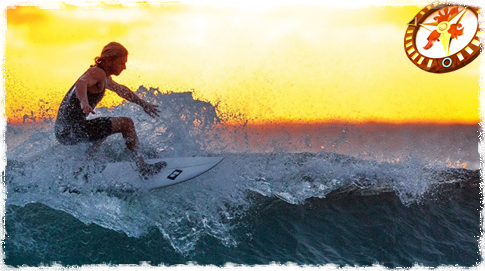 ‘What if…’ opens the door to possibility. ‘What if…’ opens the door to possibility, and a sense of possibility is always the first step towards progress. You may just find that this simple question will embolden you to take a step in a new direction and, lo and behold, see a new door opening before you. ​What you attract and what you repel in life depends more than anything upon your VALUES and these values will be aligned most directly to the Archetypes that are most dominant in your life. 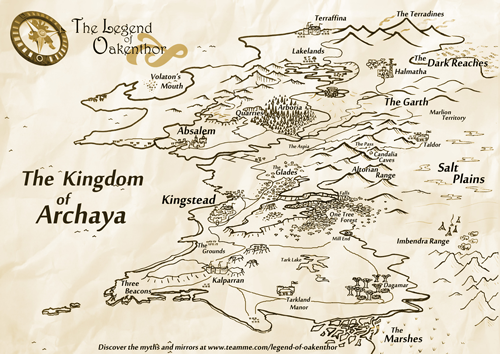 Find out more about Archetypes at www.teamme.com and use the instant Power Profiler to understand your own character in a new and empowering way. The first view of the new online app is now available. Power ProfileWant to start straight away? Head over to Your Power Profile now. ​We're finally able to announce the first phase rollout of the new Team Me Archetype Power Profiler (App, for short). There are big plans already defined for this App that I'm expecting to release in days to come, but We're unveiling this first critical step now to gain feedback on its ease of use, its accuracy, and its value. I wondered about guiding you through each step to explain each detail of the system but I thought it better to simply let you loose and see how you get on. It's primarily designed to help you understand yourself better - to discover your natural strengths and become aware of tendencies that may not be helping you so much. Whilst there are many different profiling tools out there, each seeking to classify people in different ways, this system is rooted upon archetypal characters that are easy to understand and easy to remember. What's more, archetypes, which by their definition have been around forever, run deep within our psyche - so we're dealing with powerful motivating forces that are ingrained within us. Recognise these traits, and you'll begin to understand why you typically do what you do. And why you find yourself highly effective in some situations and really pretty useless in others. It will explain why certain relationships are extraordinarily fulfilling and others are a continual drain. At this point in the app development we just have the first key bits of profiling functionality in place. So your feedback at this stage would be most valuable. Later I'll explain where I see this going, but for now, tell me how you got on. ​Crucially, tell me if it is something you'd want to recommend to a friend and if you would want to share it as it is or would wait before it has been developed further. So please diving the profiling exercise only takes about 90 seconds and then we’ll see what you discover in terms of Next Steps. We human beings all seem to have a tendency to either be extrovert (outgoing, expressive and ​​social) creatures, or the introvert (quieter, less expressive, more thoughtful and less sociable) kind. Recognising these traits, and benefits and limitations that each can lead to, is definitely an important piece in the puzzle of understanding character. The study of Archetypes however pays no consideration to the dimensions of introvertedness or extrovertedness as these traits are not tied to any particular archetype but can be applied to any one of them. There may be a tendency for the deep thinking Sage to be more introvert in their nature, and the more passionate Warriors and Lovers to be, on the whole, more expressive and thus extrovert. Yet we need to be careful not to generalise and make this true for all cases. We should not immediately make assumptions but assess the matter separately. I would always use the most simple test to help a coaching client get clear on the matter. The one question to ask, that immediately reveals whether someone is more introverted or extroverted in their nature, is to ask what they do to recharge. Party or solitude? Do you get together with other people or do you seek out time alone. The extroverts always seek out a group of people with whom they get on as this recharges their batteries the fastest - it's as if they need a stimulating environment where the interplay with other people generates new energy and revitalises them from the outside in. Introverts need the exact opposite. They need time and space to be alone because they recharge from the inside out and if there's too much stimulation going on around them they simply can't connect to the inspiration or energy they need from the inside. This is an important distinction and is one that every corporate manager needs to be aware of as they assess the schedules that they expect the individuals on their team to follow. It also helps individuals and families to plan their days including holidays in such a way that they each create the environment they need to recharge. 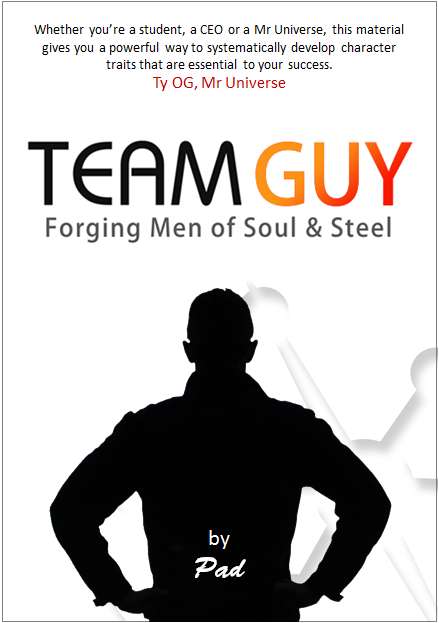 So there are no strictly introverted or extroverted archetypes in this universal archetype model that we use in Team Me. Instead it is important that we assess the matter separately and include our conclusions in a more holistic assessment of the individuals concerned. Types, including Archetypes, form one dimension of human expression but clearly do not amount to the whole story. Other dimensions, such as gender, introvertedness/extravertedness and more besides are also really important. So let's continue to create an integrated understanding of ourselves and the others around us from a multitude of perspectives so that we create the fullest picture possible where nothing is ignored and nothing is missing. It's a clear fact that we cannot live in a flow state every waking moment of our lives - that's one thing to clarify right at the start. It should be our aim, however, to set up our days - even our professions - with a determination to get into flow on a regular basis but we should recognise the value of the different levels of flow - and even the value of periods out of flow. If you missed the earlier posts on Discovering Flow and Hacking Flow, these provide a foundational understanding for what we're about to unpack in this post. It's wonderful to plan times of sheer, exuberant fun but it is a weak individual who can only appreciate hedonistic activities and shuns their responsibility of tackling the necessary mundane. My advice is that we quit stealing fire and start, instead, to generate it in a way that suits our nature. 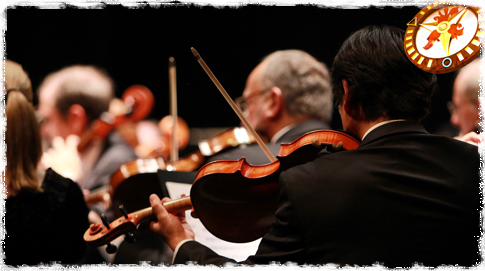 Mastery comes when we relentlessly pursue our passions and practice methods that suit our core character types. In order to master the Flow State it's essential that we understand our own, unique Pathway to Flow. Whilst there are many similarities to the essential aspects of the flow experience, we each have a preferred way to trigger that flow. 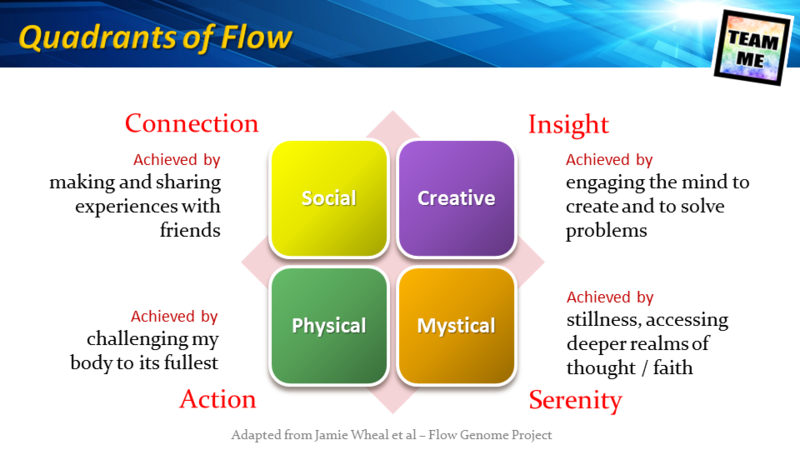 The clever folks at the Flow Genome Project have defined four ways to achieve flow: Social, Creative, Physical and Mystical. 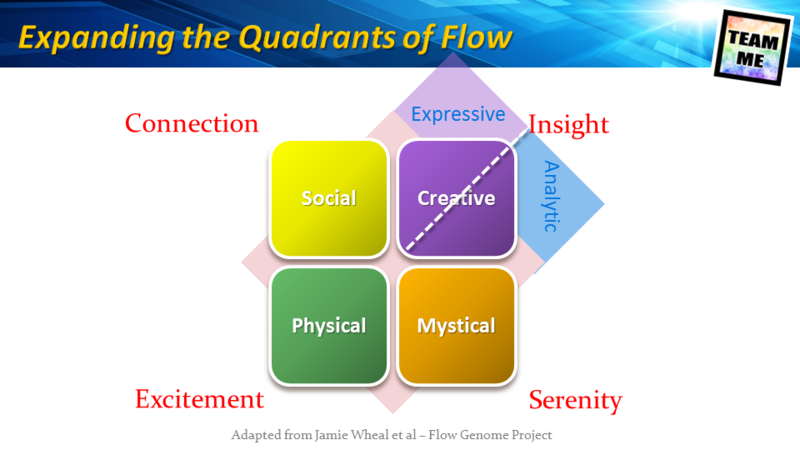 The fabulous lesson we can glean from this model is that there are different paths people can use to get into Flow. Different people quite naturally gravitate towards particular ways because, being direct about it, different things turn them on. Those who achieve transcendent states by connecting with others will opt for the Social pathway and seek out friends who seek the same. The scene is set by the gathering of souls - whatever the situation - any place where continual interaction is guaranteed. Add food, drink and music and the occasion will ignite and blaze for hours. To get their juices flowing, these guys just need a big white board and something to mark it. Whether creating an explosion of artistic expression, creating a technical solution design or forging new, mathematical equations, the creative flow types thrive in previously unexplored territory at the convergence of concepts and ideas no one had formerly brought together. 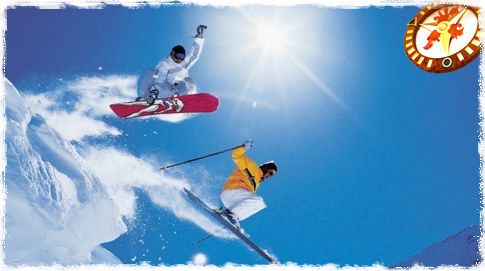 This is where the snowboarders, skydivers, runners and gymnasts come in. 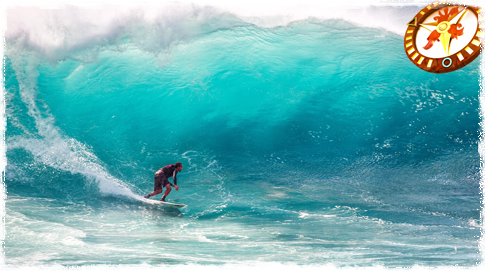 A board, a mountain, a pitch or some apparatus in the gym triggers their particular kind of flow. They physically challenge themselves in situations that demand their total focus and highest level of skill - then they flip into the zone.... and time stands still. Exploring inner worlds, these meditative folks just need somewhere to sit and turn inside. Rich, natural environments are favoured by some; others can get just as deep in a mud hut. They struggle past the chatter of the monkey-mind and find themselves transcending the limits of normal cognition - transforming their concept of what it means to be human as they explore a completely interconnected universe. 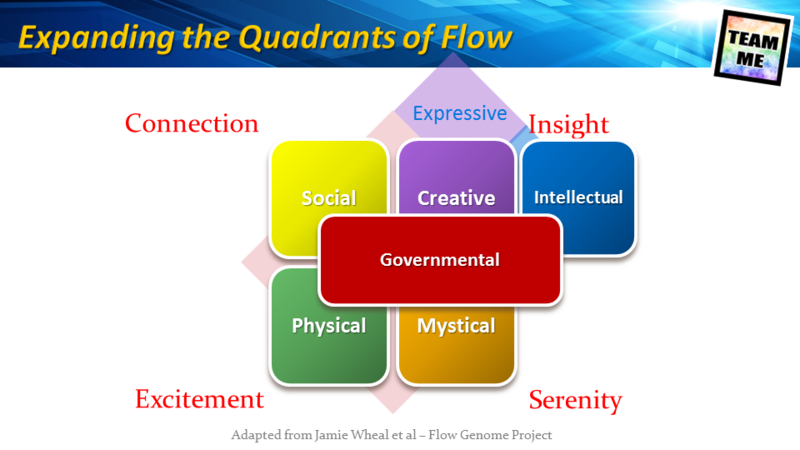 Whilst these quadrants are a very useful starter, from my explorations into Flow, I believe this model would benefit from some further distinctions which will lead us to identify two additional paths to flow. Firstly, to classify into one box both the kind of creativity we see expressed on the artists canvas along with the analytical creativity we see on the mathematician's chalk board seems to require a significant generalisation. Whilst it's clear that insight and perception are required for both kinds of activity, it would be better, I feel, to separate the analytic from the expressive. So let's keep the 'Creative' label for the expressive, artistic types and label the analytical types 'Intellectual'. But there's still a type missing from this model, for there are some people whose greatest portion of time goes not to any of the aforementioned areas of activity but, instead, act as a leader over all. These people get into their own kind of flow when they are at the helm, directing the affairs of their team, their company or their movement. We could call this function Leadership or the Governmental. If you're familiar with the TEAM ME model of six universal archetypes, you may now see a pattern emerging. Just as the TEAM ME model of archetypes emerged (notably) from the brilliant work of Robert Moore and Douglas Gillette, which defined FOUR key archetypes, so here we find that a division into four 'ways' masks some important distinctions. 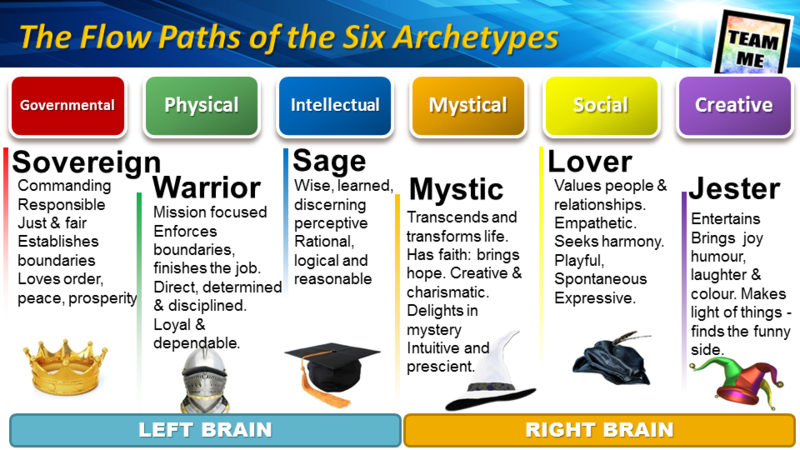 The match between the Six Paths to Flow we have identified and the Six Universal Archetypes is immediate and obvious. If you know your dominant archetypal character, your pathway to Flow will be easy to define. ​High performers in every field do it; professional athletes do it; musicians and poets do it; and the SAS and Navy SEALs do it. When the stakes are high and the cost of any mistake is nothing short of disastrous, it’s crucial that you know the secrets to stepping into the optimum state of mind required to deliver at your very best – to play your very best game. Such a state of mind can occur in individuals engrossed in their activity – whether it’s work or play – but it can also be seen in teams that have stepped into a state of togetherness, of unity that has them operating is perfect sync with their colleagues. Once all the plans and preparations are done and the activity rehearsed as many times over as time has permitted, every performer knows it’s time to step out and deliver the goods. 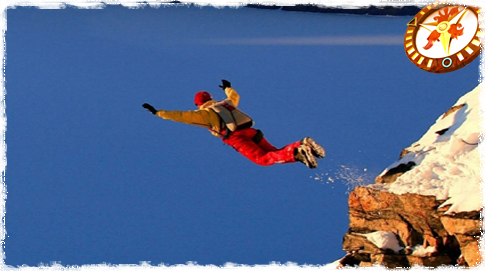 Those who are paying with high stakes; whose careers, even their very lives, depend upon their performance know that moments after they take the plunge, something kicks in that seems to be beyond their direct control. It’s as if they have accessed a live current; tapped into a stream of awareness that carries them forward and empowers them beyond their natural abilities. In such a state, when the richness of the moment floods the senses - time seems to vanish, actions become effortless and even the sense of self becomes blurred as the performer and the performance merge into one. Such a state is common to numerous lines of activity and so a variety of terms have been coined to label these moment: Jazz players call it ‘being in the pocket’ and other musicians ‘the Groove’, marathoners call it ‘the Runner’s High’, cricketers call it ‘the Zone’ and the US Navy SEALs speak of activating ‘the switch’. 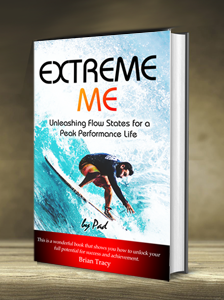 FLOW is a period of intense focus when you find yourself completely absorbed in what you’re doing and, when you need to deliver the goods, you’re also performing at the very edge of your capabilities. Practically everyone has been there at one time or another. In a moment when time seems to disappear, your sense of self vanishes as you are completely caught up in the demands of the task at hand; in the action, in the challenge and in the joy that seems to envelop you. Long distance drivers know it well, computer programmers go there often; book readers, gamers and singers get so absorbed in it that the feel like they’re on another planet. ​​As a leader it is vital that you understand how to get the best out of yourself and of your team. This can only really be achieved through an understanding of the factors that enable each one to get into their personal state of FLOW. 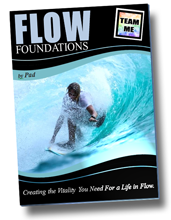 With this understanding, you’ll learn what you can do to set yourself up to spend your hours in your own flow state and achieve much more – whilst also enjoying what you do a whole lot more. Discover the language of the Lover - poetic, engaging, emotional and longing. This is another poem from Pad's book The Yearning - Poetry of Love and Longing. 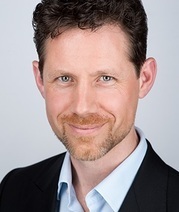 Develop your understanding of the Lover to deepen your relationships with others, to help galvanise teams and increase the depth of your connection with those important to you.